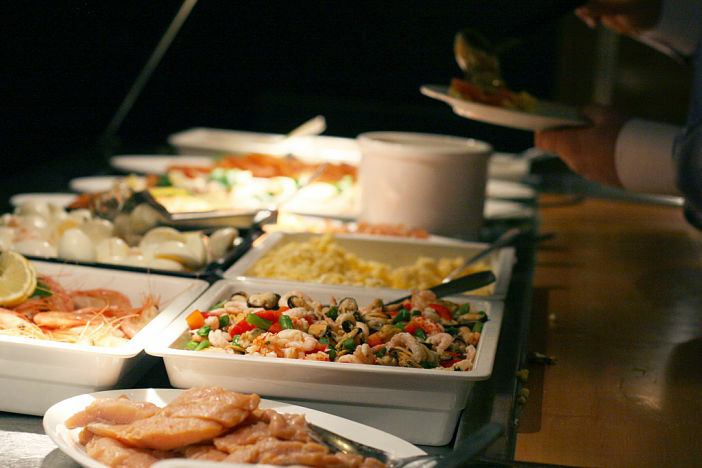 Cruise ship buffets have come a long way since the days of lining up like schoolchildren to pile a load of pre-cooked food onto your plate. As people generally are having a greater appreciation for finer dining, cruise operators have moved to improve the options available to passengers. The current trend certainly seems to be the novelty of having your food prepared in full view, just the way you like it, at spots known as action stations. From pasta dishes to Japanese-style grills, each cruise line is working to sufficiently differentiate themselves from the competition, while at the same time offering a decidedly similar concept. Let’s have a look at who’s doing what. Celebrity: The Oceanview Cafe, found on the line’s Solstice-class ships, is the informal dining choice for passengers. Bright and airy, the options at the action stations range from stir fry, meat carving, sushi, sandwiches, and the obligatory pizza and pasta, complemented by a top notch salad bar and desserts. Princess: With the Horizon Court, a huge, comfortable, thoughtfully designed buffet space on the new Royal Princess ship, the Princess line have excelled themselves. Expect to find Japanese Hibachi grills and meat rotisserie stations, with fresh soup on offer in distinctive Le Creuset pots. You can even make your own tacos, should you want to, while kids will enjoy their own special buffet area as much as the grown-ups will enjoy the peace while they go off to find it. Viking River Cruises: A departure from the other, seafaring cruise lines, Viking River Cruises do as the name suggests. Operating in Europe, there is nothing wrong with the breakfast and lunch buffets, but the afternoon open deck buffet is something special. Taking its lead from the street food of wherever you happen to be, the food and drink varies accordingly. Think cevapcici in the Balkans, go for strudel in Austria, and expect the wurst in Germany. Norwegian: As you would expect from an operator at the forefront of the action stations movement, the Norwegian Epic, Norwegian Breakaway and upcoming Norwegian Getaway ships all feature the Garden Cafe, a bright space served by chefs ready to prepare your food before your eyes. Pasta and pizza, deli and carved meats, salad and Indian dishes, burgers with a choice of toppings and lush desserts await. Seabourn: As a luxury line, Seabourn has taken a different approach to the buffet, which is served in their Colonnade restaurant. Wanting to maintain an air of superiority, it isn’t really a buffet in the real sense of the term. While you do choose what you want from the stations, chefs will plate it for you and waiters will help you to carry it all to your table. The food itself is no less than what you’d expect; wonderful salads, fresh soups, charcuterie, and sublime desserts abound. Oceania: Simply put, the best buffet you will find on the high seas. On their Marina and Riviera vessels, chefs in the gorgeously decorated, spacious Terrace Cafe cook up such fare as lobster, steak, lamb chops, and shrimp, on an all-you-can-eat basis. And as if that wasn’t enough, sushi, fresh pasta, and other hot dishes found in the Grand Dining Room are available too. The desserts match the mains, and the outdoor seating is a lovely addition, which all adds up to a wonderful culinary experience. Image sourced via Flickr Creative Commons. Credit: Brooke Ward. Atvik L Oslo.